My family spent a week recently in a farm house in the mountains outside of Galax, Virginia. Many who come to Galax do so in pursuit of country music, river adventures or just to relax and get away from it all. I went looking for stars. The image above is a single exposure taken with a Nikon D800 and the Nikkor 14-24mm f/2.8 lens zoomed all the way out to 14mm. The exposure was 15 seconds at f/2.8 and ISO 4000. The light in the house on the first floor comes from just the vent light over the kitchen stove. The light on the second floor (as well as the trees behind the house) comes from lights in the back hallway. The bedroom doors on the second floor were all cracked open just a bit to allow the hall light to illuminate the windows. 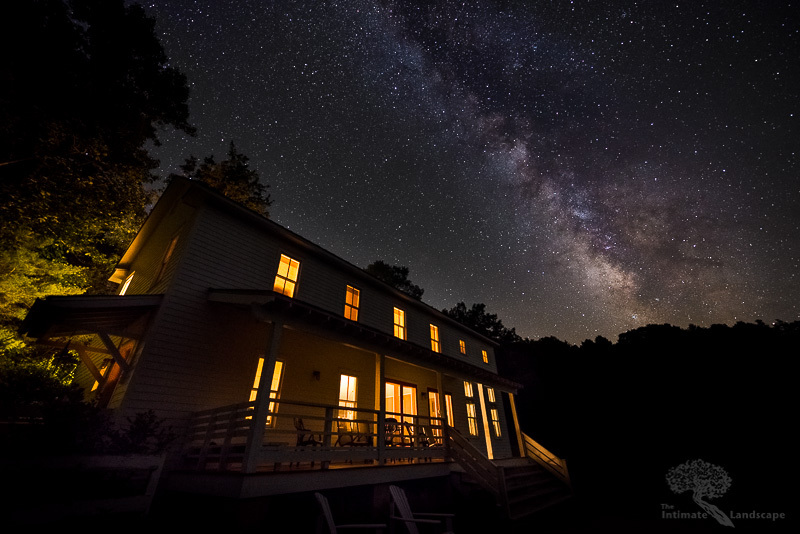 When I bought my D800 and the 14-24mm lens, it was with just this sort of purpose in mind – stars. Unfortunately, this is the first chance I’ve had to actually use it for that purpose. The few other times I’ve been in a position to try this, the weather never cooperated. This time, however, everything was perfect. Well, except for the fact that I had to wait about 40 minutes after setting up this shot to actually take it. As soon as I was set up, a jet flew through the scene and formed a contrail that glowed red from the light coming from nearby Galax. I had to wait for it to slowly drift through, and out, of the scene. This entry was posted in Stars and tagged Farm House, Galax, Galaxy, Milky Way, Stars.